Dr. Kate McClure completed her undergraduate degree at The Ohio State University obtaining a Bachelor of Science in Nutrition. She then continued her education at The Ohio State University receiving her Doctor of Optometry degree and graduating magna sum laude in 2016. 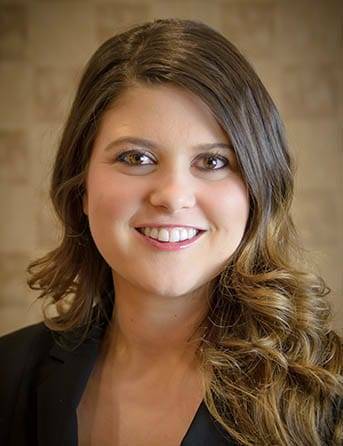 Dr. McClure is currently in her second year of an Advanced Practice Fellowship in Cornea and Contact Lens, working towards an additional degree, a Master’s degree in Vision Science. Dr McClure serves on the faculty at OSU as a clinic instructor where she teaches clinical examination techniques and oversees optometry students in direct patient care. She also conducts contact lens research. Dr. McClure has a passion for primary care optometry and specialty contact lenses. She has experience fitting specialty contact lenses for conditions such as dry eye, keratoconus, and high astigmatism. She also fits CRT and bifocal contact lenses. In her free time, Dr. McClure enjoys spending time with her husband, Kevin, and Golden Retriever, Eddie. They are avid sports fans and cheer for Buckeye football and the Columbus Blue Jackets.